The PT-76B is a Rank IV Soviet light tank with a battle rating of 5.3. 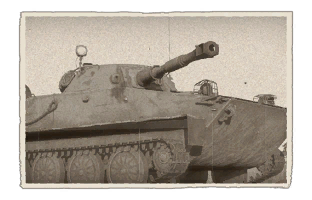 It is the first amphibious tank to be implemented in the game in Update 1.53 "Fire Storm" (although the amphibious feature was not implemented until 1.55 "Royal Armour"). The PT-76B, as a light tank, has paper-thin armour, but has a powerful main gun that can engage most tanks at its battle rating. Pretty much every enemy tank in the game will be able to destroy the PT-76B with relative ease due to the ultra-thin armour of the tank. Especially avoid tanks with access to heavy machine guns on their turrets such as most American tanks, the IS-2 1944, etc. Also, keep well clear of enemy SPAA. 12.7mm guns and above will absolutely wreck this tank. In particular, the Wirbelwind is a big threat. It has good penetration at range and will literally saturate the vehicle with autocannon shells. Just a short burst from the quad 20mm guns will finish the PT-76 off. Ammo racks of the PT-76B. As the PT-76 doesn't have much armour, avoid directly confronting enemy tanks. In order to defeat heavy/medium tanks, watch them and fire when they are not aiming or focusing on the PT-76. Use the light tank's maneuverability and fire rate to deliver pin-point hits onto the enemy's flanks, then retreating before they can get a fix on the firing location. The PT-76 is also helpful in scouting enemy positions for its allies so they could bring in more firepower. The PT-76B does not have the armour nor the crew to take on enemies, so try to remain stealthy. It is great as a scout tank in Simulator Battles. While the PT-76 has amphibious capabilities, it is not necessary use them all the time. Keep in mind that the PT-76 can only go about 10 km/h in the water, so utilize the ability to travel on land as well. Instead, use the water to make an escape or take a shortcut. As an example, drive into the water if an enemy has spotted the PT-76 and take cover behind an off-shore rock. Driving through a river to flank the enemy is also possible if a bridge is not nearby. Take caution that reversing in the water in slow if not nonexistent, which may get the PT-76 stuck if driven into an obstacle. Also make sure to check the map, as some maps like Eastern Europe have rivers with no way to get back onto land, or at least not many. Otherwise, avoid directly confronting an enemy. Instead, take cover and scout. Another good tactic to use is watching the enemy- Find a spot where they can't engage and watch them. Wait for the right moment- when the enemy is reloading, aiming somewhere else, not noticing the PT-76, is attacking an ally, etc- quickly check to make sure no other enemy can target the PT-76 when it exposes itself to attack the enemy! Try to snipe at the enemy, But make sure to avoid all enemy fire as all tanks can penetrate the PT-76's armour. 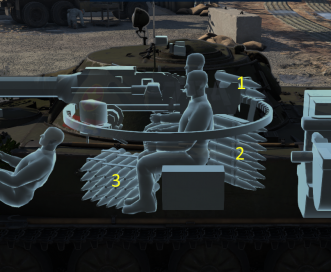 (Even the GAZ-AAA (4M) technically has enough penetration to get through the tank's rear armour!) The amphibious capabilities are a huge helper to the vehicle, allowing it to reach unusual sniper areas that vehicles without said capabilities could not reach (e.g. hiding behind the rocks near the jetty on Normandy). The incredible stabiliser also allows the PT-76 to simply sit in the water and blast away at enemies without them even realizing where the shots are from. Make sure to relocate after knocking out enemies or being spotted, however, as they will know the PT-76B's location, and likely broadcast it to other players, most often resulting in the PT-76B being sunk. 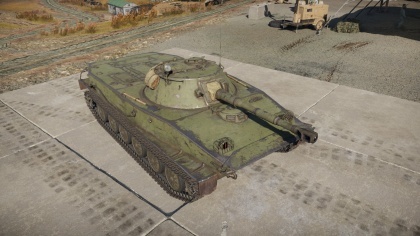 The HEAT-FS shell is powerful in terms of penetration, but the post-penetration damage is lacking compared to other Soviet shells. Not to say that the BK-350M is weak (It's actually quite amazing for a HEAT shell), but often, 2 or more shots will be needed to destroy an enemy, particularly the more spacey vehicles like the Tiger 1 and Panther. It would be wise, therefore, to look up crew and module locations on enemy vehicles so that each modules can be targeted and disabled. Access to HEAT-FS shells with excellent penetration at 5.3. Has a two-plane gun stabilizer (the only non-Rank V USSR tank with it!). Stabilizer works while shooting on water. Excellent scout tank to spot targets for allies. Lack of turret rotational inertia. Very thin armour all-around, even heavy machine guns can pen through the front. Stock round is APCR, requires aiming of weak points until better rounds are unlocked. Efficiency will be greatly reduced with a loss crew member. Shooting from water will shake the whole vehicle, but not the aim. Performs rather poorly in AB due to inability to hide nametag. Driving on water is quite slow, forwards at 10 km/h and reverse at -7 km/h. Relatively slow reverse rate on land and on water. The purpose of light tanks fell into disuse in the course of World War II. The light tanks of every nation found themselves to be too lightly armoured and under-gunned to be of any use in the battlefield. Their mobility, which they once held with utility, was overtaken by the advancing mechanics of tanks that allow the heavier tanks to reach speed and mobility that light tanks used to monopolize. The utility of light tanks fell to specialized roles, mostly as a reconnaissance vehicle. The Soviet Union developed a light-weight vehicle for this role, with an additional requirement that the vehicle also be amphibious in operation. The amphibious operation would grant the tank a greater degree of movement over different terrain. Prototypes of the tank started in late 1940s, one was Object 740 developed by N. Shashmurin at the VNII-100 research institute of the Chelyabinsk Tank Factory in Leningrad. The vehicle was more successful than the others for using a simple design and good cross-country travel. The amphibious operation, the water-jet propulsion, was considered a breakthrough at the time. Prototype of this vehicle began to be built in 1950 at the Kirov Plant, and adopted in August 6, 1951 after trials. This vehicle became designated as the PT-76 and production began at the Stalingrad Tractor Factory. An upgrade was made in 1957 that replaced the initial D-56T gun with a D-56TM with a muzzle brake and fume extractor, as well as new observations and radios for the expense of a taller profile. Another upgrade in 1959 was made that added the D-56TS gun with stabilization and NBC protecton capabilities on the PT-76B. Production lasted from 1951 to 1969 for a total of about 12,000 PT-76 built. The PT-76 saw use in Soviet Union, who used it as their standard reconnaissance tank and in naval operations. The PT-76 stayed stationed at various of bases during the Cold War, but did not see much combat with the Soviet Union, staying until it was replaced by the infantry fighting vehicle BMP-1. Despite its replacement, the PT-76 stayed in reconnaissance companies and battalions and in the naval infantry units, as well as having a much better gun than the BMP-1. The PT-76 may still be in Russian service today in reserves as some have been reported to been used during the war in Chechnya. The PT-76 also served in a various of specialized roles such as an anti-aircraft mount. The PT-76 was exported in large numbers to up to 25 different countries allied with the Soviet Union. Of these, Vietnam has the best combat record due to the Vietnam War, the PT-76 was a large part of the North Vietnamese Army's armoured force during the conflict. The PT-76 first successful action in Vietnam was in the Battle of Lang Vei in February 1968, where 13 PT-76s of the NVA 202nd Armoured Regiment fought against up to 500 defenders of the camp. The PT-76s were able to overrun the camp despite the defender's use of M40 recoilless rifles and M72 rocket launchers, which accounted for three PT-76 kills. Another combat engagement was in the Battle of Ben Het when the NVA 202nd Armoured Regiment was ordered to attack the base there. The PT-76 detonated a mine on the border of the camp, alerting to their presence. Several M48 Pattons of the 1/69th armour battalion was sent to engage the tanks, but one got hit by a PT-76 round and had two crewmen killed. By dawn after sporadic firefights between the Pattons and NVA tanks, the scene revealed two knocked out PT-76s and a BTR-50 APC. It was in 1972 where the PT-76 served as the test bed of an important American weapons development. Two helicopters in May 9 were scouring the country side for enemy targets for its new armaments, it was at this time that the NVA attacked a camp at Ben Het. The helicopters responded, firing the experimental XM26 launchers at PT-76s and accounted for three PT-76 destroyed. This was the first combat usage of what would be the TOW anti-tank missile. Aside from Vietnam, the PT-76 also served in the Indian forces during the Indo-Pakistani Wars, the Six Day War and Yom Kippur War on both sides, the Angolan Civil War in Cuban and MPLA service, in the Iran-Iraq War in Iraqi service, and the Yugoslav wars. This page was last edited on 27 January 2019, at 23:55.